Introduction: The management of acute appendicitis (AA), despite the controversy surrounding it, is having constant increase to minimal access surgery. The discussions focused on the advantages of this type of surgery, throughout the specialized literature, are usually based on reports of procedures performed by well-trained surgeons, rather than resident surgeons. 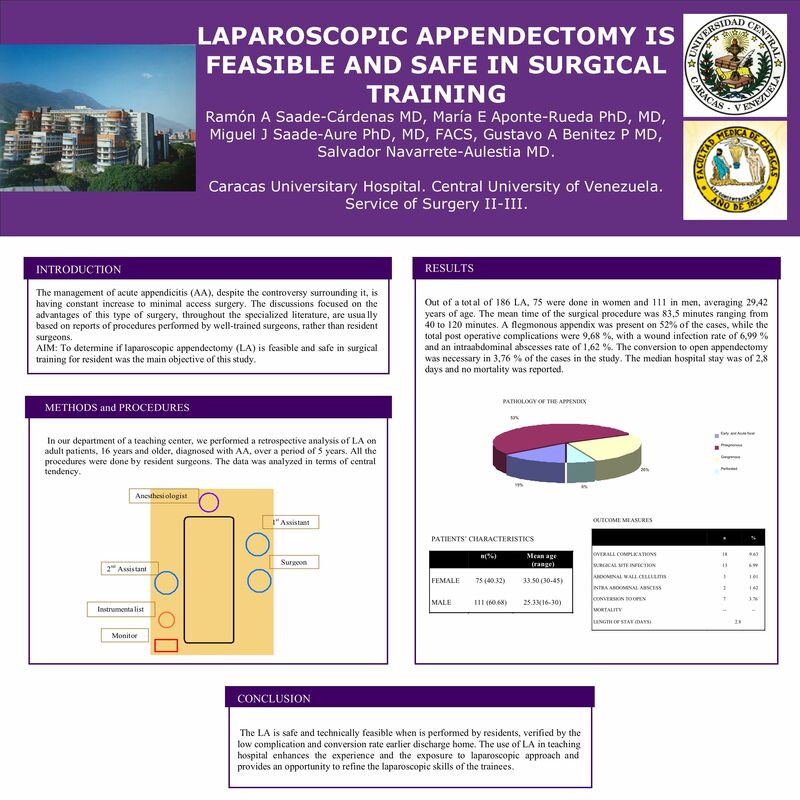 To determine if laparoscopic appendectomy (LA) is feasible and safe in surgical training for resident was the main objective of this study. Methods and Procedures: In our department of a teaching center, we performed a retrospective analysis of LA on adult patients, 16 years and older, diagnosed with AA, over a period of 5 years. All the procedures were done by resident surgeons. The data was analyzed in terms of central tendency. Results: Out of a total of 186 LA, 75 were done in women and 111 in men, averaging 29,42 years of age. The mean time of the surgical procedure was 83,5 minutes ranging from 40 to 120 minutes. A flegmonous appendix was present on 52% of the cases, while the total post operative complications were 9,68 %, with a wound infection rate of 6,99 % and an intraabdominal abscesses rate of 1,62 %. The conversion to open appendectomy was necessary in 3,76 % of the cases in the study. The median hospital stay was of 2,8 days and no mortality was reported. Conclusion: The LA is safe and technically feasible when is performed by residents, verified by the low complication and conversion rate earlier discharge home. The use of LA in teaching hospital enhances the experience and the exposure to laparoscopic approach and provides an opportunity to refine the laparoscopic skills of the trainees.